“Children of all ages joined with our local Councillors and officials last Saturday afternoon in proudly witnessing the annual display of Welwyn Garden City’s Fire Brigade. Among the guests at the diplay was Mr. Stanley Gifford, Chairman of Welwyn R.D.C. Fire Brigade Committee. The event had special significance in that the new Leyland Motor Pump was formally handed over to councillor Clapham Lander as Chairman of the Council. Under the command of Fire Chief Dougherty the new pump with its older small brother made an excellent demonstration turn-out, followed by the Garden City ambulance. 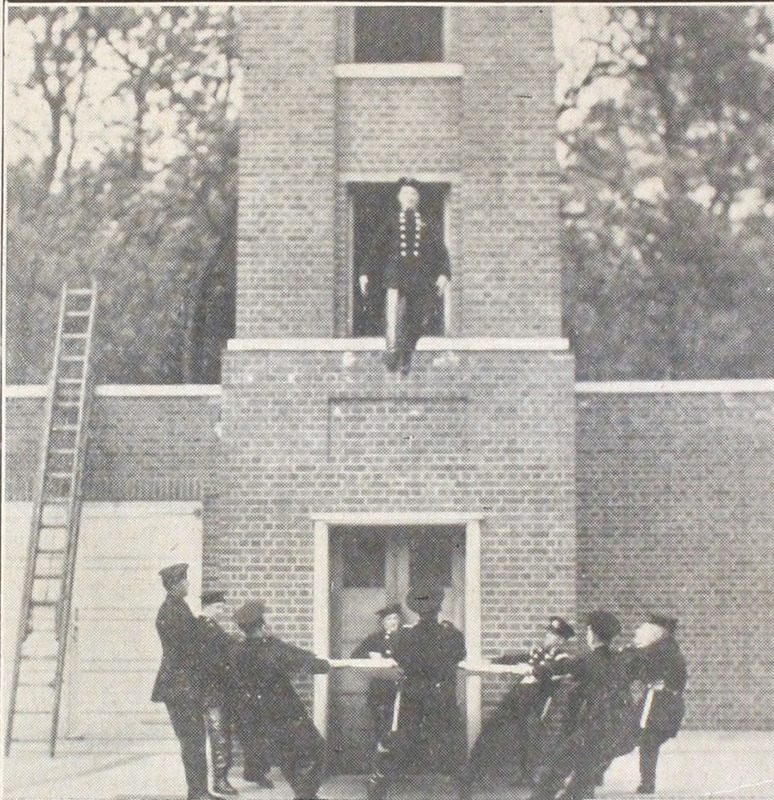 After a circuit of the capmus that drew alarmed glances from citizens unaware of the occation for the demonstration, the brigade returned to the fire-station yard for drill exercises. 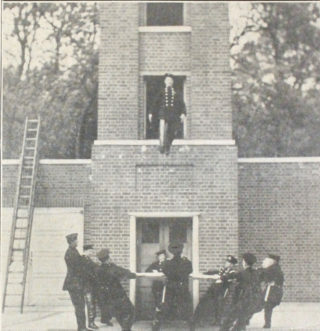 These included smart displays of the “Fireman’s Lift,” jumping from high up the hose tower into a sheet, hose drill and rescue work by means of the new fire escape and a very ingenious piece of apparatus that enables a helpless person to be slowly lowered from a height in a rope sling. Finally there was a dramatic rescue from a “smoke-filled room” by a fireman (complete with gas mask and oxygen cylinders) of a victim who was given artificial respiration and removed in an ambulance. 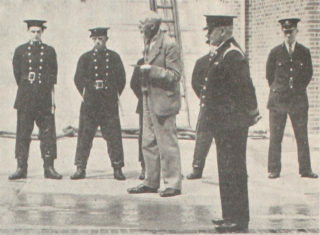 Councillor Lander inspected the men and in an interesting brief address said that this years inspection was of more than ordinary importance; they were now taking over formally the new Leyland motor-pump, and it was appropriate to review the growth of the brigade during the last sixteen years. When it was first formed in 1922, Capt. W. E. James was in command of four volunteers. They had a hose reel on a hand cart and 30 feet of hose. In spite of this meagre equipment they did very fine work at a fire at the Bridge Road Stores and at another outbreak at Digswell Lodge. In 1927 the late Capt. 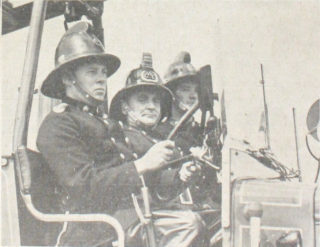 Kelly took over the command and in 1930 they purchased their first motor pump. This was still being kept as a reserve and he was glad to hear that it still was capable of very useful service. Shortly after this there was a fire at the Theatre and the prompt work of the brigade saved it from being burnt down. Their present chief, Capt. Dougherty took command in 1932 and with his team of twelve men had made steady progress. He warmly congratulated Capt. Dougherty and the brigade as a whole on their very high standard of efficiency. 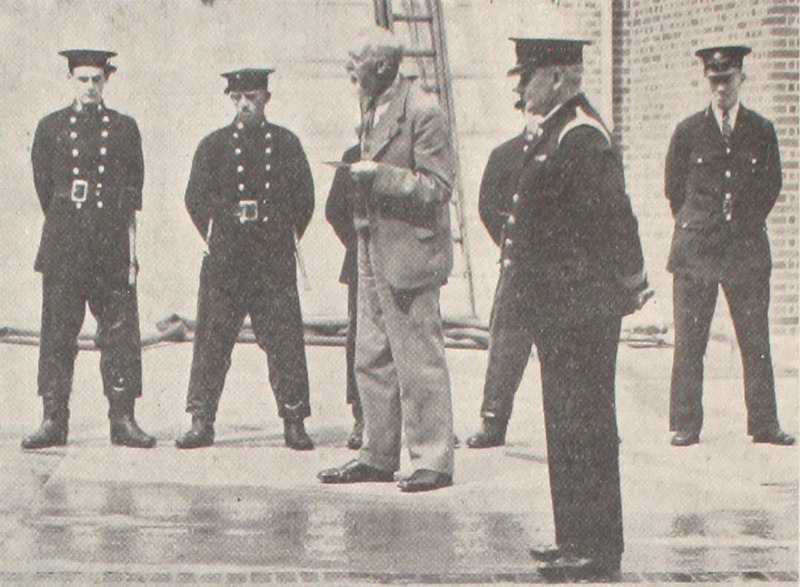 My father was in the WGC Fire Brigade and would, I am sure be one of those present at the time of this article. At Christmas the Fire Brigade, which became part of the NFS shortly after the outbreak of war, held a party for the children of firemen. The appliances would be parked out in the yard at the back and we were entertained in the Appliance Room. It was always understood that in the event of a call-out we would be left with the reserve crew and civilian staff. I would have loved to have been there when “The Bells Went Down” and been part of the excitement, but it never happened. Lovely to see the photographs of Captain Jack Dougherty, he resided at 15 Walden Place in the 1930’s, and all these years later we bought the home in which he lived. It turns out that some of the properties in Walden Place were built for Key Workers which of course Captain Jack was! Each winter I will think of him as I place a log on his open fire, we even have the original fire shovel to lift the grate!